Must Present Coupon With Incoming Order. Not Valid With Existing Orders. One Coupon Per Order. Coupon void if altered. Expires 05/06/2019. Print dry cleaning coupons for Ridge Cleaners. Ridge Cleaners has 4 convenient locations-1 location in North Ridgeville, 1 location in Amherst and 2 locations in Avon Lake. 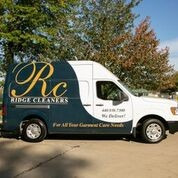 A family owned and operated business built on trust and integrity, Ridge Cleaners strives to offer the highest quality and most convenient services, including home pick up and delivery, on site 24 hour drop off and pick up, wedding gown cleaning and preservation, alterations and tailoring, leather & suede cleaning & more! For added convenience, we offer drive thru service at two of our locations. Servicing North Ridgeville, Avon, Avon Lake, Westlake, Rocky River, and surrounding cities. Print valuable coupons for Ridge Cleaners here and save on dry cleaning! Free Pick Up & Delivery! Dry Cleaning, Laundry Service, Free Pick Up & Delivery, Drive Thru Service, After Hours Drop-Off, After Hours Pick-Up, Household Item Cleaning, Leather & Suede Cleaning, Wedding Garment Cleaning, Wedding Preservation, Garment & Fur Storage, Alteration Depot, At Home Pick-Up and Delivery. Westlake, Ohio, Bay Village, Ohio, North Olmsted, Ohio, Fairview Park, Ohio, Olmsted Falls, Ohio, Avon, Ohio, Avon Lake, Ohio, North Ridgeville, Ohio, Lorain, Ohio, Elyria, Ohio, Sheffield, Ohio, Rocky River, Ohio, Grafton, Ohio.